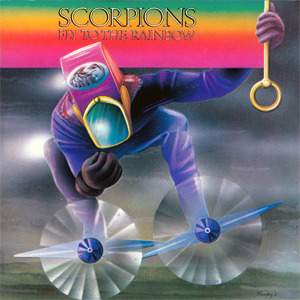 Fly to the Rainbow is the second studio album by German heavy metal band Scorpions, released in 1974. In support of their Lonesome Crow album, Scorpions appeared as the opening act for the British hard rock/heavy metal band UFO. At the end of the tour, Scorpions lead guitarist Michael Schenker was asked to fill an open position as UFO's guitarist and accepted the role. Schenker's departure temporarily resulted in the break up of the band but Rudolf Schenker and later Klaus Meine ultimately merged with the band Dawn Road which consisted of guitarist Ulrich Roth filling Michael's role, as well as drummer Jürgen Rosenthal, and bass guitarist Francis Buchholz. The new line up resumed under the Scorpions name and recorded Fly to the Rainbow which moved to a more heavy metal sound than the previous experimental psychedelic Krautrock of their first album.